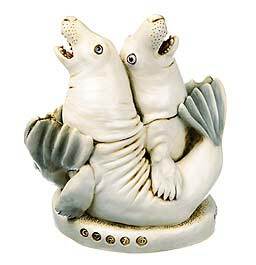 This box figurine depicts two seals, lovingly entwined, mouths open in song. A plimsol line with numerical markings runs down the belly of one of them, a representation of the amount of oil that can be extracted from an elephant seal. Peter carved the cigarette lighter under the other seal’s flipper after a beach-combing trip in North Wales where he found the beach littered with plastic lighters. Peter’s mouse looks out startled from under another flipper. The inspiration for the rat carved inside was a topical news item that Peter misheard on the radio at the time of carving: the “monster rat” catastrophe. It turns out that it was the “Montserrat catastrophe,” a volcano threatening to erupt in the Caribbean. Hallmarks include ©, heart, HBC logo, ed.#, and Pc, with "P. Calvesbert" on the base.